If you like the band, the Red Hot Chili Peppers like I do then maybe you might be interested in the plant world’s version of wild and fiery. 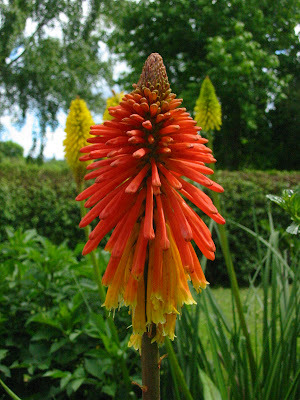 Kniphofia, A.K.A. ‘Red Hot Poker’ is a staple perennial found in many British borders. This is where we first discovered this phenomenal showpiece for the garden. People don’t pay too much attention to this plant in our neck of the woods. But once someone spots its funky form and color, it becomes a must-have plant, especially when it is already situated in a border. Its unique eye-catching flower spike has bright red-orange to yellow variations. It also displays ivory but that’s its ho-hum color. Although it claims to be hardy to zone 5 conditions, it may not reach its normal size without protection. If you are in a very exposed area, you can give it extra winter armor by wrapping it. A few minor details about where to place it: full sun, well-drained soil and although it does like it hot, give it ample moisture during dry spells. You might select a protected area rather than one of the more exposed locations in your garden. A few plant ideas to go with Red Hot Poker: Russian Sage, Geranium ‘Nimbus’, Eryngium 'Sapphire Blue' commonly known as Sea Holly and Crocosmia 'Lucifer'. Although none of our Red Hot Pokers have matured to full size like they do in the British borders, you should still give these plants plenty of elbow room. So if you like personality in your garden, then give the red hot’s a go. Turn on some Chili Peppers and get rocking and planting. (And for those of you who know I took up the drums this year, my favorite Red Hot Chili Peppers’ CD to practice to is ‘By the Way’. And by the way, our inspirational quote of the day is by Albert Einstein. “When you are courting a nice girl an hour seems like a second. When you sit on a red-hot cinder a second seems like an hour. That's relativity.” Sorry, none of the lyrics make too much sense from the Chili Peppers to be our inspirational quote but I love their beat! Plus Einstein really gets his point across on relativity. Hope I do, too on this gardening gig. Now let’s rock and plant!